Shorter University offers a wide variety of scholarships funded from the University’s own resources. Deadlines and criteria vary greatly, so check with the Office of Admissions or the Financial Aid Office as far in advance as possible. 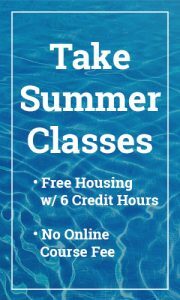 No institutional aid is available for summer semesters. Institutional aid may only be applied towards tuition. The Application for Admission to Shorter University is also the application for Academic Excellence Scholarships, excluding Competitive Scholarships. Academic scholarships are awarded based on academic GPA and SAT or ACT scores. Amounts range from $1,200-$8,000. If you have questions about an Academic scholarship, please contact the Admissions Office. These scholarships are stackable with our Shorter Excellence Scholarship and Baptist Appreciation. If a student has obtained a 3.5 GPA, and is offered an athletic scholarship, they have the option of stacking both scholarships. The Shorter Excellence Scholarship is awarded to those student who have obtained a 3.0 GPA. The scholarship varies, based on if the student is a commuter or resident. For resident students, they will receive a $4000 Shorter Excellence Scholarship where a commuter student will receive $2000. These scholarships are stacked on with the Academic Merit Scholarship. However, if you are to receive an athletic scholarship, you will not have the ability to stack this scholarship. Shorter University offers a limited number of Baptist Appreciation scholarships to students who are active members of GBC churches. You must be a member of the GBC church, this information will be verified before the scholarship is applied. The Goizueta Foundation Scholarship and Hispanic/ Latino Student Scholarship is need-based assistance designated for Hispanic/Latino students that currently reside in the United States. These students must be accepted to Shorter University prior to applying. Students must turn in FAFSA (if applicable), students can be considered for this scholarship as a U.S. Citizen, DACA, or Non-U.S. Citizen, however must meet regular admissions requirements. The Missionary Dependent Scholarship is for children of those engaged in mission work. Students must provide detailed information about their missionary work and the areas that they have served. Competitive Scholarships are awarded to a limited number of applicants based on outstanding academic credentials and a personal interview. A separate scholarship application is required. These scholarships, when combined with certain other forms of financial aid, may cover full tuition. Contact the Office of Admissions for further information and deadlines. Students who qualify for this scholarship must have a 3.5 GPA and 24 ACT or 1100 SAT, transfer students must show a 3.3 GPA. Shorter University Enhancement Grants are awarded based on a combination of Financial Need and Academic Rating. Amounts vary for each individual student. Students must fill out the FAFSA to be considered for the Shorter University Enhancement Grant. Scholarships in music or theatre require an audition. By contacting the Office of Admissions, we will be able to point you into the right direction on who to contact to set up an audition. These scholarships can be stacked with other scholarships, depending on the criteria. Students interested in an athletic scholarship should contact the coach in that area to find out more information. Once a scholarship is in place, the office of admissions will contact you about options. As athletic scholarships are rarely stacked with other institutional aid, unless the student has obtained a 3.5 GPA. The Georgia Tuition Equalization Grant is available to Georgia residents enrolled full-time in an undergraduate program at an eligible private college or university in Georgia. For more information about award amounts or to apply online, click here. The HOPE Scholarship Program is available to Georgia residents who graduate from eligible Georgia high schools with at least a 3.0 GPA. Georgia residents who were not eligible at high school graduation can become eligible by having at least a 3.0 GPA at 30, 60, or 90 attempted semester hours. Students must have a cumulative 3.0 GPA at 30, 60, and 90 attempted semester hours and a cumulative 3.0 GPA at the end of each Spring Semester to determine continued eligibility. Students must be enrolled at least half-time (six semester hours) to receive HOPE Scholarship at Georgia private universities. For more information about award amounts or to apply online, click here. Has earned a baccalaureate (four-year) university degree, regardless of whether or not HOPE funds were received while earning the degree. The Student Access Loan (SAL) Program is administered through the Georgia Student Finance Authority (GSFA). The SAL loan program is designed to be funding of last resort for college students who have a gap in their college financing. The interest rate on the loan is based on when the student completes the program of study. Each loan includes an origination fee of 5% of the loan amount not to exceed a total of $50 dollars per loan. The fee is deducted from the first disbursement of each loan. Loan funds may be used towards any part of the student’s cost of attendance. Interest payments are required while the student is enrolled. Minimum interest payment is $15.00 for loans received on or after July 1, 2012. The minimum loan amount is $500. The maximum loan amount is $10,000 per year up to a maximum of $40,000 over a college lifetime. Origination Fee: A non-refundable $50 fee is deducted from the first disbursement of each loan. Please go to the following link for further information and to apply. Beginning with the fall 2011 semester, a new state grant program is available to students who meet the eligibility criteria. Students who are eligible for the Zell Miller Scholarship will receive it instead of the HOPE scholarship. Students graduating from high school with a 3.7 HOPE GPA and 1200on the math and reading portions of the SAT or 26 on ACT (both are single test scores, not best from multiple testing) and graduate from High School in 2007 or later are eligible. Students who graduated as Valedictorian or Salutatorian, as long as they meet HOPE requirements (NOTE: only 1 each per high school per year) are eligible. Students who entered college between 2007-2010 and are currently in college with a 3.3 gpa at the most recent checkpoint (Spring 2011) and met all other high school graduation requirements listed above for the ZMS are eligible. Students must maintain the 3.3 gpa at all usual HOPE checkpoints; end of each spring semester and once completed 30, 60, and 90 attempted credit hours to maintain eligibility. If a student loses ZMS at any checkpoint, the student can still get HOPE, assuming all requirements, including the 3.0 gpa are met. For additional information go to www.gafutures.org. By filing the FAFSA, you are automatically considered for these Federal student financial assistance programs. In order to qualify, you must meet the specific criteria for each program. In addition, the Title IV Authorization Form needs to be completed by every student receiving Federal Aid. The Federal Pell Grant is a grant that does not have to be repaid. Pell Grants are awarded only to undergraduate students who have not earned a bachelor’s degree. Pell Grant is need-based and the FAFSA is required to determine eligibility. The Financial Aid Office will notify you if you qualify. The Federal Supplemental Educational Opportunity Grant (FSEOG) is for undergraduates with exceptional need and gives priority to students who receive full Federal Pell Grants. SEOG does not have to be repaid. Students may be awarded FSEOG based on the availability of funds. The FAFSA is required to determine eligibility. The Federal College Work-Study Program provides jobs for university students with financial need, allowing them to earn money to help pay educational expenses. Your award depends on when you apply, your level of need, and the availability of funds. The FAFSA is required to determine eligibility. A current list of available Work Study positions can be found in the “Search for Work Study Job” link below. Students are responsible for contacting potential employers to set up interviews. For more information on Work Study at Shorter University, please login to SCHOLAR, click on the Financial Aid tab at the top and click on Work Study in the left side navigation. The Federal Perkins Loan is a low-interest (5 percent) loan for students with exceptional financial need. The school is your lender. You must repay this loan to your school. You may qualify for cancellation of your Perkins Loan under certain conditions. The FAFSA is required to determine eligibility. The Federal Direct Stafford Loan is a low interest student loan that enters repayment six months after the student ceases to be enrolled at least half-time (six semester hours). Stafford Loans are categorized as Subsidized (need-based, Federal Government pays interest while in school) and Unsubsidized (non-need-based, student is responsible for interest that accumulates while in school) It is available to students enrolled at least half-time. You must complete the FAFSA . After your FAFSA is processed, Shorter will review the results and inform you about your loan eligibility. Visit studentloans.gov to complete a master promissory note (mpn) and entrance loan counseling. For other loan forms, please click here. The Federal Direct Parent Loan for Undergraduate Students (PLUS) enables parents with good credit histories to borrow to pay the education expenses of each child who is a dependent undergraduate student enrolled at least half-time. The annual loan limit is equal to the cost of attendance at Shorter College, less any other financial assistance the student is receiving. A PLUS Loan application can be completed at www.StudentLoans.gov. For more detailed information on these Federal Student Aid Programs, please visit The Student Guide.